Tesla Technicals Confirm Deal In The Works? 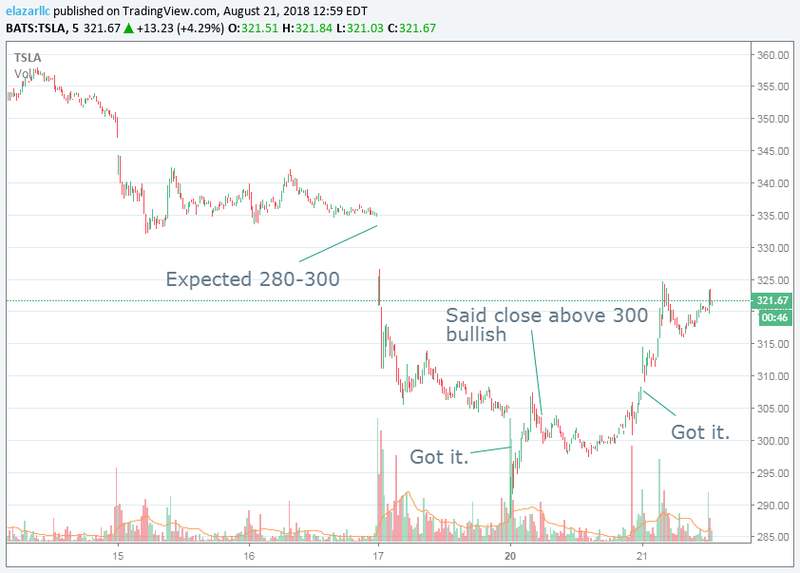 We said yesterday that a Tesla stock close above $300 was bullish. We got it. Thursday we told subscribers we thought we'd get below $300. We got it. This morning we told subscribers that we're "very bullish on that strong close. It was reported that Morgan Stanley pulled their coverage of Tesla. That's bullish for a potential nearer term announcement of funding finally secured." We recommended to subscribers to buy shares on the open given the apparent nearer term deal. Add Morgan Stanley's going quiet on Tesla to Goldman's pulling of coverage last week. The negative flow of funding not-so secured is turning more positive with major investment houses pulling it together. We'd guess CEO Elon Musk is staring down this huge earnings inflection he's expecting knowing the stock's worth way more than $420. He'd love to lever some other assets and keep that upside (he's tirelessly working for) to himself. We have a target of well over $1000 based on our 2019 EPS numbers. As said before, we hope a deal doesn't go through because we think there's way more upside than $420. But $420 from here would be a nice move too, no complaints.